At the final meeting of the 2014-2015 PFI Board of Directors, the PFI Board approved a series of changes to the PFI Standards Program. The PFI Standards Program is a third party accredited program that enables consumers to easily identify PFI Graded Fuel: pellets from manufacturers whose pellets and facilities are subject to regular third party testing. There are three documents that govern the program, and all have been updated to reflect the approved changes. The documents can be accessed via the PFI website or through the American Lumber Standard Committee, the program’s oversight body. The goal of the program has long been to improve the quality and consistency of product available to pellet appliance owners, carried out through third party accreditation and requirements that manufacturers maintain continued compliance with the program specifications. While the program is voluntary, a new EPA regulation, the New Source Performance Standard for New Residential Wood Heaters (NSPS), is changing the scope of fuel and appliance standards in the United States. The NSPS requires any new non-commercial wood-burning appliance to utilize fuel that has been graded through an EPA-authorized standards program including the PFI Standards Program. For appliances such as pellet stoves, manufacturers will be required to state that their products have been tested with fuel from a particular grading program. Appliance manufacturers also must state such claims in the owner’s manuals and in their product warranties. For fuel manufacturers, you are encouraged to familiarize yourselves with the Rule’s requirements, including the need to participate in an EPA-approved grading program. EPA has approved three such programs, including the PFI Standards Program, which is the only program widely recognized in the United States. For more information on fuel standards, including the various changes and updates outlined herein, or to learn how to join the program, please visit the PFI website or contact PFI Executive Director Jennifer Hedrick. Thanks to each of you who attended the 2015 PFI Annual Conference. We hope that you found the conference informative and worthwhile. In order to make next year’s conference even more successful, please take a few moments to fill out the attendee evaluation survey. Your feedback is important to us, and will help us coordinate future events. In our last Pellet Wire, we captioned one of the photos incorrectly. 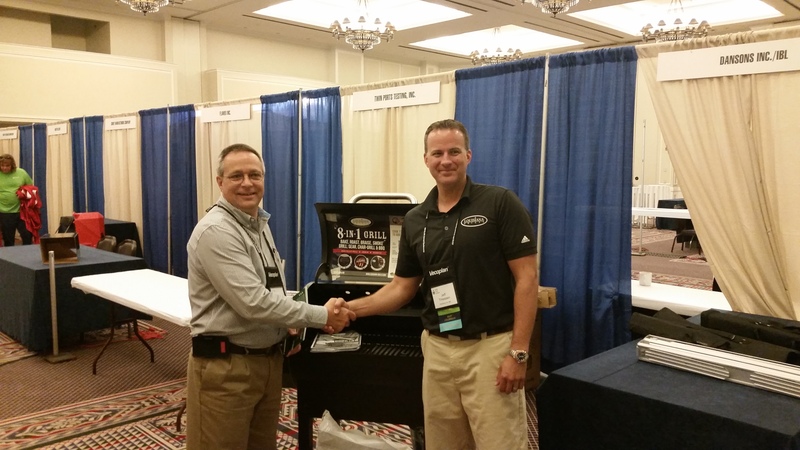 The winner of the pellet grill provided by Dansons Inc./IBL is Donald Land of Process and Storage Solutions, seen here with Jeff Thiessen of Dansons Inc./IBL. Congratulations, Donald! Thanks once again to all of the sponsors and exhibitors and speakers of the 2015 PFI Annual Conference. Stay tuned for information on the 2016 PFI Annual Conference. The U.S. Department of Energy Bioenergy Technologies Office last week released a new video on bioenergy. Titled “Sustainability in Bioenergy: A Nation Connected,” the 20-min. video is a short documentary highlighting personal stories and the efforts being made by communities across the United States to develop, produce, and provide bioenergy, while ensuring it is environmentally, economically, and socially sustainable. To view the video, please visit YouTube. To read the transcript, please visit the DOE website. If you’d like to learn more about PFI committees, check out the PFI website or contact PFI staff. Wood pellets. They’re a simple idea, but their potential implications are far more complicated and controversial. Member countries in the European Union are buying these small, compressed cylinders, which are made up of everything from sawdust to wood pulp, to use as a more planet-friendly fuel source than coal. Eventually, some say increasing restrictions on allowable carbon emissions will force the discontinuance of wood pellets as a fuel source because they’ll no longer meet government requirements. But right now, European subsidies are fueling an important emerging market in the southeast – and particularly North Carolina. Moisture content in wood chips used for energy can significantly influence system performance. Consequently, equipment and methods used to dry wood chip fuel are constantly evolving, as companies strive to perfect their respective processes, meet the needs of system operators and maximize plant efficiency. Drying methods today include simple, passive drying techniques to the advanced and energy-intensive methods.